Easy MiniFarmBox™ and grow your own vegetables-awesome! Besides saving water, a MinifarmBox™ optimizes soil drainage and aeration, giving your plants more root space. You’ll grow bigger plants with bigger crops – up to twice the yield of regular ground planting. 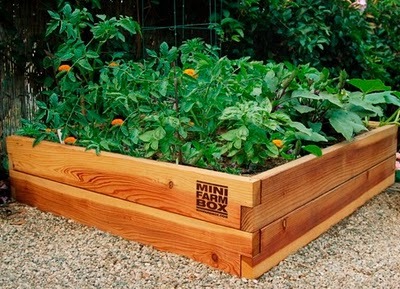 The MiniFarmBox™ is a cedar raised bed, tool-free assembly in minutes, gets less weeds, extremely termite and rot resistant, and lasts a minimum and 10-15 years untreated. I live in a condo….but I want one (whining)! Watch how quick and easy it is to assemble. The MiniFarmBox™ is available locally at one of my favorite places, Living Green Nursery, on Jeronimo between El Toro and Ridge Route. Living Green Nursery, 25290 Jeronimo Road, Lake Forest, CA 92630-4900. Phone: 949-768-4733.